Sissinghurst Gardens: A Beautiful Garden in Kent, The Garden of England. I did not want to leave Kent in England without visiting Sissinghurt Gardens as I had read so much about them in the many Home and Garden magazines that I have devored over the years. My cousin Cheryl and her husband David Crane who live on the Isle of Sheppey in Kent had, surprizingly, never heard of these fabled gardens and were only too happy to discover them with me. You can see them (below left) at the entrance to the gardens outside the “Oast Houses” with their conical roofs–the typical structures in which hops used for making beer were left to dry. Many of these homes are now being c0nverted into residential homes and David and Cheryl actually lived in one such home for a while. 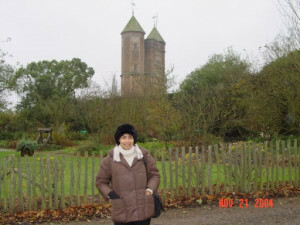 Infortunately, we chose to visit Sissinghurt in November, a few weeks after the gardens had closed down for visits. However, we were able to cross the medieval moat (left) and arrive at the Elizabethan Tower that was built in the 15th century–a perfectly and very stately English entrance to this most quintessential of English gardens. Indeed, some would call it the very best garden in the British Isles and the vast number of visitors it receives through the popular summer months would bear testimony to that distinction. To appreciate the beauty of Sissinghurst, a property that has been managed by The National Trust since 1967 when it was purchased by them, one ought to know a little bit about the Edwardian lady Vita Sackville-West who was born and raised in nearby Sevenoaks, Kent, in a a grand manor called Knole House (which is also today open to visitors). Since she was a female and an only child, her parents’ home passed into the possession of an uncle (as English Law did not allow daughters to inherit real estate). Heartbroken at losing her beloved home, Sackville-West, by then married to the writer and diplomat Harold Nicholson, moved to the ancient castle called Sissinghurst . The couple spent the rest of their married lives refurbishing the delapidated castle and developing the gardens. Conceived as a series of ‘rooms’, each sporting a different mood and character, by Nicholson, the plantings were done by Sackville-West herself with inspiration received from gardens in other parts of England designed by the legendary Gertrude Jekyll and Edwin Lutyens (yes, the architect of New Delhi) as at Hidcote Manor in the Cotswolds. The ‘Rooms’ are created through the use of high and well-clipped hedges and through the red brick walls that give the typical English garden its distinctiveness. Famous for having created The White Garden, Sackville-West conceived of a plan that by planting only white flowers would allow her to have a garden that would glow in the moonlight. The concept has become tremendously popular with gardeners and has been frequently imitated and reproduced. By the end of the 1930s, the project was complete and the garden was opened to the public. 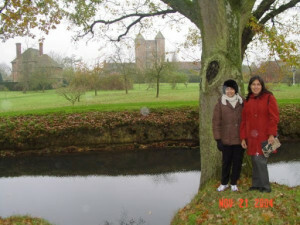 It is one of the most popular sites of tourist interest in England. At left, you can see Cheryl and me standing at the little modest wicket gate that marks the entrance to the Gardens. 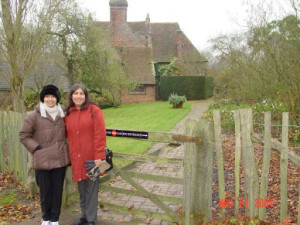 Though I could not see much of the garden, Cheryl and I did stroll around the perimeter and took a number of pictures of the castle and the little Tudor cottage (left) . I also saw a very fine film recently entitled All Passion Spent which was based on a novel by Vita Sackville-West. Though it did not suggest that the story of the protagonist mirrored the life of Sackville-West herself, I very strongly suspect that some elements of it certainly did. Sackville-West shared a very close friendship with the novelist Virginia Woolf who spent a great deal of time with her at Knole House and wrote about it in her memoirs. Needless to say, it is one of my goals to return to Sissinghurt at a time when the gardens are open to the public to walk along the gravelled pathways and rose arbors created by this industrious couple who shared a vision of beauty that brings so much joy today to people from around the world. 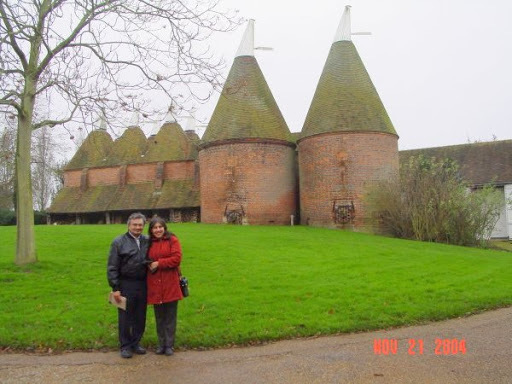 I hope you will consider making a trip to Kent and visiting Sissinghurst yourself.